we walked through the massive Spanish door and it was like walking into a secret garden. 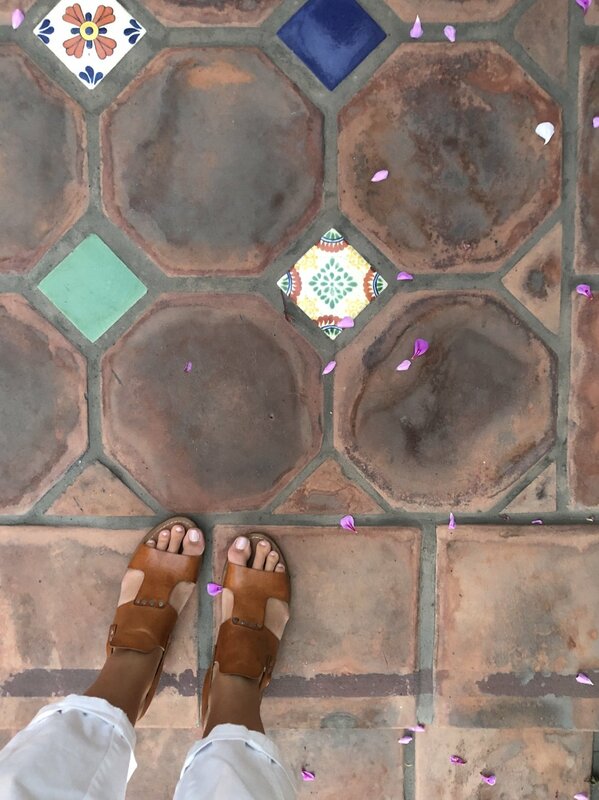 vibrant fuchsia blossoms burst from planters along the worn tiled walkway with soaring palm trees and little seating arrangements scattered here and there. as we wound our way down to the reception area to check in we passed a secluded pool, the staircase that lead to the ocean-view spa, and the outside breakfast nook. it was like a dream. i loved how everything about this hotel felt built into nature - everywhere you looked there were beautiful greens or delicious smelling blossoms or fruit hanging from trees. the small seating areas that were throughout were always placed in such an inviting area that it almost made you want to stay outside rather than your room. no matter where you wandered, you could always hear the sound of water, whether it was the soft roar of the ocean or the tinkle of a water feature. while the hotel isn't incredibly large, i wish i could have spent more time exploring all the little corridors, staircases and amenities. i know there must have been more hidden gems. the historic common building, for hotel reception, breakfast and lounging was nested along the roadside with a view from every window overlooking the ocean. inside was simply decorated with blue, white and golds with star-shaped hanging lights, charming seating arrangements with fluffy pillows or rich leather chairs and pure natural light streamed through the windows. it was nearly everything i wanted in a Spanish style home. in the evening when we arrived, there was a fire started in the fireplace, giving the area a relaxing, lounge vibe. i wanted to grab a book and curl up in one of the arm chairs, but we were only staying for the night so no time for relaxing. in the morning, adjacent to the small kitchen, was a table filled with heathy, yet delicious foods. scrambled eggs, turkey bacon, chia pudding, yogurt and granola, juice, coffee and milk, etc to say it was charming doesn't even capture it. we sipped coffee outside in the little courtyard right outside the kitchen until breakfast was ready and then nestled into a padded window seat to eat. 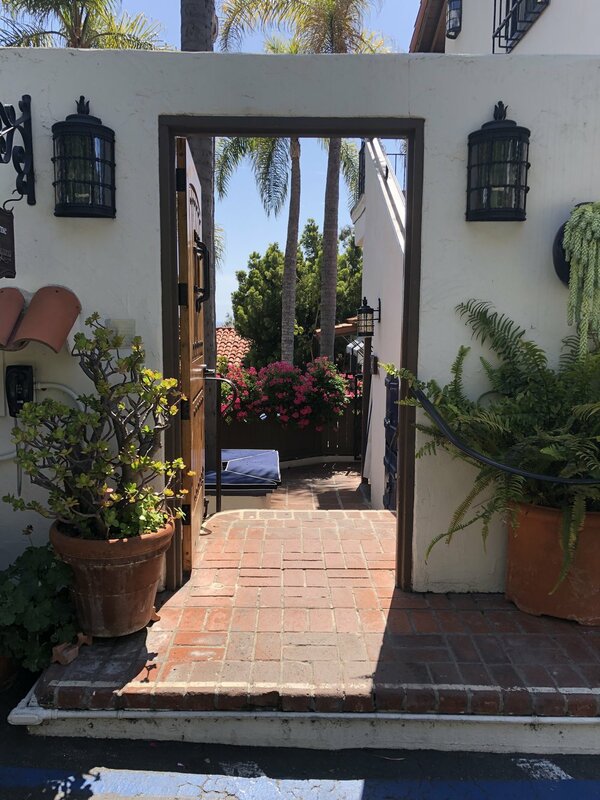 once checked in, and after being led through the maze of courtyards, she opened the cobalt blue door to our room - a deluxe ocean view room with patio. i think we both were surprised with the gorgeous space and i definitely squealed after she left. the room was the perfect combination of california vintage and cozy. you walked into the room with a view of the bright bed, personal bar nook, and heavily draped sliding glass doors leading to the patio. the ceiling was covered in an intricate pattern and beautiful star light. i couldn't decide where to look first. when you turned around to face the room from the patio doors, you noticed a closet, complete with fluffy white robes, and a little writing desk. the bathroom was a dream! tucked behind a pocket door, it was complete with more gorgeous tiles, an incredible standing shower, art deco vanity and vintage themed photographs. it was a spa in and of itself. the patio is where we ended up spending a good amount of time both on the day we arrived, that night and the morning before leaving. we sipped the house sangrias we were given here and wine later that night. and after eating breakfast the next morning we decided to finish our third cup of coffee here. it was going to be a long trip home - we are not usually 3-cups-a-day kind of people. the neat thing about the patio was that you could see your neighbors. we had checked in on a sunday so we really didn't have or see any one else, but it allowed for a deeper sense of community. what can we say, they were wonderful. upon check in, we were greeted with big smiles and food recommendations; at breakfast, they bustled about making the space feel warm and inviting; and at checkout everyone was just as friendly as check in. we couldn't have asked for better service. absolutely! between the elegant exterior, cozy rooms and welcoming staff, this was an amazing experience at a boutique hotel and cannot recommend casa laguna hotel & spa enough. and to be honest, the room prices are really not too bad. we only were able to stay one night due to other travel arrangements, but i'd be more than happy to come back to try all of their amenities. regardless if you're traveling in the area or a local, this hotel will not disappoint. you will feel refreshed, inspired and so very loved. so, go on, book your stay! note: this post was in no way sponsored or requested. all opinions and thoughts were captured because we had such a lovely time and felt everyone should know about this hidden gem.